After years of helping returning citizens successfully reacclimate to their communities, the Green ReEntry program is poised to significantly deepen its impact. In partnership with the Emerson Collective, Green ReEntry has expanded the size of its cohorts from a handful of brothers to a dynamic, intergenerational group of over 30 men. 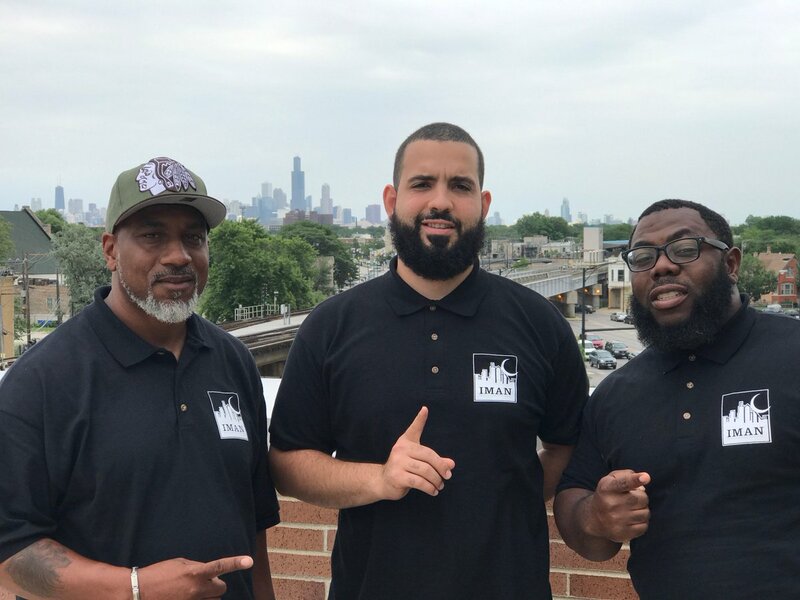 To facilitate the continued success of Green ReEntry participants, IMAN has hired three highly skilled full-time staff: Case Manager Billy Moore, and Case Workers Ali Kanoya and Gemali Ibrahim. We sat down with the new team to learn more about their stories and their vision for Green ReEntry’s future growth. What does the Green ReEntry program have to offer? Billy: We’re working with men who are really facing significant challenges to their wellbeing, so it’s imperative that our work has a positive impact. Our goal is to shift the way that these guys think about themselves and their communities, and we’ve developed a curriculum to achieve that by instilling values of brotherhood, professionalism and conflict resolution. Ali: Life skills training is another key component. We speak a language the participants understand, and we grew up in similar communities to theirs. Our job is to be a guide and mentor to young brothers who haven’t had that luxury thus far in their lives. What inspires you to get involved in this work? It’s far from easy. Gemali: I feel the most spiritually attuned in those moments when I’m recognizing the interconnectedness of the human family. One of the ways God has shown me that He is real has been through brotherhood. Helping my fellow community members is a practice that’s been a part of my life since childhood. It’s in my DNA at this point, and I consider IMAN and the surrounding area to be my community. Billy: Returning citizens looking to get back on track, avoid re-offending, and contribute positively to their communities must do so with extremely limited resources. This opportunity to serve others is a blessing, because I know all too well what it feels like to sit on the other side of the desk and need help successfully reintegrating into society. IMAN has been in the trenches for years now doing the work, directing significant resources to those who need them in a way that’s relevant and compassionate. Ali: I will never forget a realization that I had during my final days of incarceration. I remember seeing intelligent, strong-willed, physically fit, and brave brothers all around me. It hurt to see the beauty of our community locked up like that. I wanted to see that beauty flourish back at home, doing something positive in the streets. I still want that, and Green ReEntry is the best outlet I’ve seen to accomplish that goal. At this current moment in Chicago, why is the Green ReEntry program so necessary? Ali: Chicago has been associated with gangs and violence for generations, but what can’t be forgotten is the fact that those traditions also included real valor and codes of ethics that people lived by. That legacy has worn away, and we see the youth in chaos on many levels as a result. All of these young guys aren’t monsters. That’s an artificial message that’s being promoted in the culture, but that’s not who these guys really are at their core. We need to reach back and encourage young men to develop a sense of accountability, perseverance and dignity. God willing, we can shift that culture. Gemali: I remember meeting a brother at Ramadan Reflections. He said he refused to bring his children because he wasn’t sure about “what kind of neighborhood IMAN is in.” He lives maybe 30 minutes from the office. That affected me, because of how much I love this city and the relationships that I’ve built here. But, if you turn on the TV, you understand how he can feel that fear. I am inspired by the example of Prophet Muhammad (peace be upon him) as he first entered the city of Medina. He instructed the people to spread peace, feed the hungry, and spend time at night in prayer. We need to reflect more deeply on the fact that he said “spread peace” first. Billy: Chicago is a world-class city, there’s no denying that. But, what is becoming clearer even in mainstream media is that the story of Chicago, in reality, is a tale of two cities. The wellbeing of our part of the city isn’t prioritized. You hear about the violence and the homicides, the 40% unemployment among young men in Englewood, the 54 closed schools, and the underrepresentation of Black-owned businesses. Legislators and other officials play a role, but programs like Green ReEntry are what really empower individuals and families to take control over their lives in a meaningful way. This entry was posted in Direct Services, One Chicago, Youth Services by IMAN Staff. Bookmark the permalink.